Seven men have been sentenced for their part in a drugs ring operating across southern England between 2006 and 2011. The men had admitted conspiracy to supply Class A drugs in Hampshire, Dorset, Sussex, Devon and Cornwall. Police said a network originating in Manchester had co-ordinated cells supplying crack cocaine and heroin. Simon Simpson, described by police as the network's head, received the longest sentence of six years and four months. 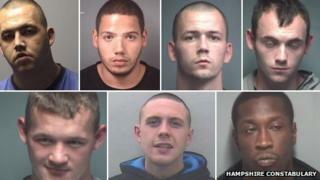 Hampshire Constabulary said it took a "thorough and lengthy investigation" to detect the gang. Det Sgt Ross Toms said: "We are committed to making the Hampshire and the Isle of Wight a hostile environment for criminals, especially those who bring with them the kind of misery and additional crime that goes hand in hand with drugs and their supply." Ryan Poole, 24, Clough Road, Manchester, Greater Manchester - 8 months imprisonment suspended for 12 months, 100 hours unpaid work.